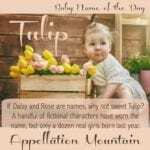 Parents have taken baby name inspiration from colors and flowers and animals, too. How about shapes? 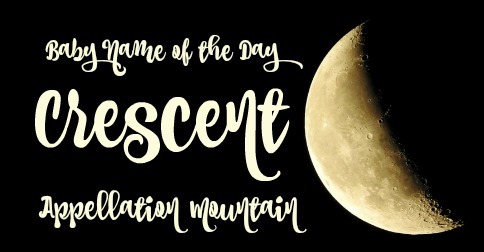 Thanks to Kristina for suggesting Crescent as our Baby Name of the Day. Crescent might be a shape, but it has ties to the natural world aplenty. 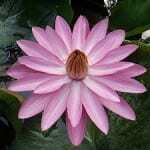 The word ultimately comes from the Latin crescere – to grow. This makes it a cousin to the Roman agriculture goddess Ceres, the musical term crescendo, as well as the French croissant. It’s a bit of a switcheroo. In Latin, the waxing moon was called luna crescens – the growing moon. The word became associated with the shape instead of the lunar phase, and it stuck. Hence, the deliciousness that is the croissant. We’ve been borrowing the lunar shape as a symbol forever. No really. Way back around 2300 BC, the Akkadians used it on their seals. It was used throughout the Middle East. The Hinud god Shiva is pictured with the shape above his head. It was associated with Byzantium when it was a Greek colony, and later with the Empire and Constantinople. The Ottomans adopted it, and Muslim empires embraced it. While it started out very much a secular symbol, it’s also associated with Islam today. Of course, it isn’t just Islam. Catholics show Mary as the Virgin of Guadalupe wearing a crown of stars, with a crescent moon at her feet. New Orleans is The Crescent City, thanks to the shape of the original city limits, and the symbol also appears on the state flag of South Carolina. Doubtless I’m overlooking dozens of other associations. 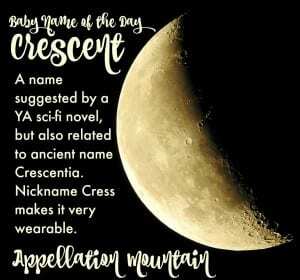 Here’s the reasons Crescent is attracting more attention as a possible given name. 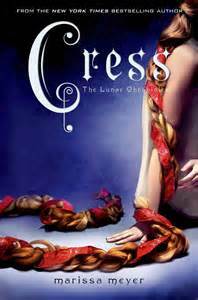 Marissa Meyer’s marvelous young adult sci-fi fairytale series The Lunar Chronicles features a character by the name. Her fairytale princesses are unlike anything you’ve ever imagined. Cinderella is the cyborg Cinder, and Rapunzel is a hacker trapped in a space station. Her name? Crescent Moon, and there’s a whole story there. The character is usually called just Cress, which feels breezy and modern – fresher than Bess, less expected than Tess, but every bit as wearable. The final book has recently been released, and rumor has it that a movie adaptation is in the works. Interestingly, the name saw some use in the 1970s and 80s. The only explanation I can find? Writer Crescent Dragonwagon – born Ellen – who has published in genres as diverse as children’s literature and cookbooks. There’s also the equally rare name Crescentia or Crescencia. Paul mentions the masculine name Crescens in the New Testament. Paul’s friend is a missionary who went to Galatia. It’s no surprise to find other forms of the name in use. 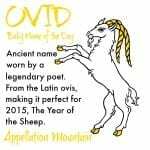 The marvelous Dictionary of Medieval Names from European Sources gives us some additional history. Since 1990, the name has been given to five or fewer girls born in the US every year. That’s pretty rare. Neither the more conventionally name-like -tia or -cia ending forms have charted in years, either. All of this makes Crescent rare, rare, rare. And yet, Luna is white hot, and night owl names for girls are very much on trend. 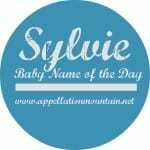 If you’re after a name that is tailored, rare, and distinctive, this could be a surprisingly wearable choice. Do you like Crescent better for a boy or a girl? Do you think it works as a given name, or this one all croissant and moon to you? I love your posts because they’re always good impetus for me to check the status of the DMNES entry for whatever name you’re discussing. There’ll be an entry for Crescent in the next edition.